Anis Zunúzí Baha'i School is an oasis of hope in the midst of chaos outside its walls. Offering excellent academics, arts and music and Youth Empowerment Programs to connect the students to, and restore their pride in their cultural identity, the school educates 355 K-12 students, of whom 55% are girls. 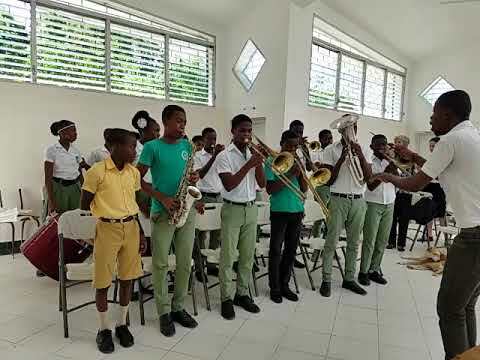 Anis Zunúzí Baha'i School was chartered to serve the poorest of Haiti’s children and has, over the course of 35 years, grown into a K-12 institution that serves 423 students. In a country plagued with civil unrest, the school serves as a refuge for the students where they not only receive a first-class education but are also guaranteed lunch (often their only meal of the day) and clean water. Courses provided include language and computing classes, debate, art, music, sciences, and moral leadership. In 2018, Zunúzí School has strengthened their administration board significantly which has directly improved the educational quality. The Board hired an Administrator who executes decisions of the Board; a Logistics Officer who manages the procurement process and support the Administrator and lastly a Pedagogical Director who works with the primary school in improving educational quality. The teachers were engaged in an ongoing dialogue aimed at increasing their skills as teachers and improving the quality of the instruction offered in their classrooms. For 20 years, the Mona Foundation has supported the development plans of Anis Zunúzí as submitted by their Board each year. Anis Zunúzí continues to prioritize providing students with a good academic education that is in line with the Haitian Ministry of Education, and a strong moral education that fosters individual and community transformation. These complementary educational efforts support the education of girls and boys in a manner which supports both material and spiritual prosperity for the individual, their families and communities. Unlike many schools in Haiti, Anis Zunúzí unwaveringly promotes a violence-free environment of learning. Thanks to all these factors, school continues to see a high passing rate of state exams for its students of about 95% compared to the national average of 22%. There are currently 9 children’s classes with 150 children in attendance, 7 junior youth groups working with 44 junior youth functioning in the countryside around the school. These activities serve to strengthen community life by teaching principles that promote unity and love as well as preparing the youth for service projects which are of benefit to their own community. These efforts are completed through the moral education program of Anis Zunúzí and empower both participants and facilitators to engage with their peers and their communities in meaningful and sustainable activities. Such efforts are critical for individuals and communities around the world; in Haiti it is an exceptional process which moves away from the concept that development and aid equates passive recipiency. At Anis Zunúzí, growth is sustainable and engages with beneficiaries who are active in their own agency - and this process is in large part due to both local leadership and the moral education program which stimulates individual growth and service from within the community. In January 2018, the Conseil and Administrative Committee invited CAFT - a local organization dedicated to teacher training - to conduct a two-day visit at Anis Zunúzí to assess the strengths and weaknesses of the teachers and teaching environment at the kindergarten and primary classes. The goal was to identify what is happening, give the teachers support in areas where they would like to advance and reflect on how to add to their current strengths. The evaluation conducted by CAFT will assist Anis Zunuzi in determining the effects of this teacher training and professional development on the teachers and classroom environment, and to determine additional needs for training and support. In addition to the teacher trainings mentioned above, the kindergarten teachers and the grade 1 and 2 teachers participated in a week-long refresher course from the Peter Hesse Foundation, the organization training teachers in the Montessori method. Lastly, the Schools Board engaged CAFT to conduct a multifaceted evaluation of the Anis Zunúzí Bahá’í School. This included classroom observations for each primary grade followed by individual consultations to assist every teacher to reflect on his or her strengths and areas needing development and to make a plan for the next three months. The evaluation also included tests in reading, writing and oral comprehension in both French and Creole for all 2nd grade students. Separate focus groups were held with 6th grade students, teachers, parents of 6th grade students, and members of the Administrative Committee. There were also structured interviews with individual teachers and parents of 6th grade students. A survey was completed to determine the actual schooling pathway of all 5th grade students to examine whether there are students having difficulty to progress in their schooling each academic year. There was a second survey conducted with the parents of the 6th grade students to identify their perceptions on the schooling pathway of their child. An assessment was also conducted on the number of required textbooks each 2nd grade student had in their possession. In addition, a structured interview was conducted with a preschool teacher to determine whether the School is following the Ministry of Education’s priority regulations for preschool education.The results of the evaluation are still being analyzed and compiled. Results are expected in March 2018. As a result of this program, 31 teachers were offered training and professional development from two different local organizations. By providing 90 scholarships, Anis Zunúzí is able to provide a quality education to 90 students a year enabling them to further their education and eventually complete their high school degree with the quality that will prepare them to enter university. Less than 30% of children in Haiti attend secondary school. As a result of this program, Anis Zunúzí aims to enable 90 students each year to continue their education with the aim of completing secondary school. The long-term result will be providing individuals with the education to succeed in contributing to their societies, assist their families in the poverty reduction that accompanies education, and contribute toward a more educated workforce in Haiti. Haiti is in desparate need of moral laeders who will put the interests of Haiti and its people ahead of their own personal gains and help develop Haiti's richly endowed human resources so that it can break through the cycle of dependency that has plagued and paralyzed it for the past several decades. To this end, the School has adopted the Youth Empowerment Program designed to build capacity and develop the youth to become the leaders and change agents in their own sustained community transformation. During the summer 50 children and youth chose to participate in the summer camp. They expect more this summer as they are going to offer the students to sleep over, an added element which the children like. This event has been a source of new students becoming acquainted with the school and its program of service and moral education. This year they will concentrate even more on the service component to the community. The resutls created social cohesion among the students and an increased attitude of service to the community. In addition, new students are attracted to Anis Zunúzí by increasing awareness in the community of the School and its program. Sabine Saintermil was born May 9, 2000 in Petitie Riviere, Aritbonite, a region situated more or less in the center of the country. She never knew her father so she has only one parent. In four months she will be 18. She is the middle child of a family of three, having an older sister and younger brother. When she was seven years old and in grade 2 she became a student of Anis Zunúzí. She has been receiving a scholarship from Mona Foundation since grade eight, 5 years ago. She is actually in grade 12 so should complete her studies next year. Sabine’s family is very modest. Her mother washes clothes at an orphanage in the area and does what she can to take care of her 3 children for whom she has great hopes. As her salary is far from being sufficient to cover their needs she is always looking for ways to help carry her great load. In discovering Anis Zunúzí school in 2007, after several years of trying in vain to cover the school fees of her daughter, she explained her difficulties to the people in charge. Thus she was granted a scholarship for her daughter, thanks to the generous support of the Mona Foundation. This news was like a miracle and brought a sigh of relief to the family because of the support. Sabine is happy too to be able to remain at school and complete her studies. She constantly expresses her love and her thanks to the directors and the supporters of the Mona Foundation for this generous gift. Sabine works well at school and is happy with her progress. She will finish her studies next year and plans to study administrative science. She praises the high quality of the education that the school offers, its discipline, and the competence of the teachers. She also expresses her admiration for the beauty of the buildings, their cleanliness and the charming beauty of the yard. But she is anxious about the beauty of the school which is disappearing gradually since the outer walls have fallen down due to the earthquake in January 2010. She hopes the walls will be rebuilt before she leaves the school next year. A dream which she says is ambitious. “I was really without hope when I knocked on the door of the Anis Zunúzí School. Thanks to your generosity, today I have the chance to have a better future." "I wish to offer special thanks to those who contributed and aided the Mona Foundation to enable the education of so many children in places all over the world. We, the children of Haiti, hope that this support continues to provide help to our sisters and brothers, who, like me, without this support, would not have much hope." Mona Foundation invests $50/month in the education of this aspiring young girl. Fenelon Herve, currently a senior in high school, is in the school band. For the past 10 years he has lived with an elderly lady who cares for him. After completing his daily chores, he returns to school to practice an instrument. He plays 4 instruments: trombone, flute, saxophone and trumpet. Fenelon dreams of directing the school band and is preparing himself for that role. Fenelon is serious about everything he does and has gained the admiration and confidence of everyone. His involvement in the moral education program has led him to be an animator of a junior youth group, caring for those younger than himself. Thanks to the Mona Foundation he was able to attend Anis Zunúzí School through a scholarship. The choice was not without reason. Fenelon has always shown great interest in his education. He understands that schooling is the only way to a good future. His teachers all testify to his intelligence and his respect for the school. Help us fund the growth plan of this long-standing school in 2019. $25 – Will enable one student to attend the enrichment summer camp. $50 – Will keep a student in school for a month including tuition, uniform, books and meals. $100 – Will keep a student in school for two months including tuition, uniform, books and meals. $250 – Will furnish 50% of all the preschool materials needed for the year. $500 – Covers planting and growing a vegetable garden to supplement children's diet. 423 students served of which 134 students received scholarships. Established extra-curricular activities including art classes, music, language learning (English, Spanish and French), sports, dance, driver's education, and various excursions. The most transformational of these is the moral education program. Repair of the septic tank and repair of the school’s water reservoir and the creation of system to collect rainwater, cost $9,500. Give $50 a month to support the education of one student for a whole school year.